Welcome to the New Release post and Blog Hop showcasing projects from Our Daily Bread Designs February Release! You can see all of the February Releases here. Continue reading below to find out how you can win one of three $25 Gift Certificates to the ODBD Store good towards the purchase of ODBD stamps. I have two projects to share with you today, using the new Life is a Gift and Miss You stamp sets along with some previously released ODBD stamps and dies and a"sneak peek" at the beautiful ODBD Shabby Rose Paper Pad Collection that will be releasing soon! My first card uses the ODBD Life is a Gift and Mini Tag Sentiments stamp sets. All stamps are stamped in Coffee Archival. I colored the stamped image with STAEDTLER Karat Watercolor Markers, sponge Soft Sky clouds in the background and die cut the panel using the Circle Ornament Dies and layered the panel on a Kraft panel that was die cut using the Matting Circles Dies. The word "celebrate" is layered on a Kraft panel that was die cut using the Mini Tags Dies. To embellish I added a Kraft panel that was die cut using the border from the Antique Labels and Border Dies, Zva Creative Crystal Gems, twine and Soft Sky Seam Binding. My next card uses the Miss You, Life is a Gift and Mini Tag Sentiments stamp sets. I used the Spotlighting technique to spotlight the wildflowers. All stamps are stamped in Coffee Archival. After stamping the wildflowers on my white card stock panel, I die cut the circle using the Circle Ornament Dies, coloring only the die cut panel and layered the panel on a Kraft panel that was die cut using the Matting Circles Dies. The word "with sympathy" is layered on a Kraft panel that was die cut using the Mini Tags Dies. I used Soft Sky ink to sponge clouds in the background. To embellish I added a Kraft panel that was die cut using the border from the Beautiful Border Dies, Seam Binding and Twine. Three randomly selected winners will each receive a $25 gift certificate to Our Daily Bread Designs, good towards the purchase of ODBD stamps found in the "stamps column" of the ODBD Website, just for commenting on the Design Team cards! You have until Monday, February 2, 2015 at 9:00 p.m. EST to leave your comments. The Winners will be posted February 3rd, on Our Daily Bread Designs Blog, so be sure to check back there to see if you won! LOVE them both, Lisa!! The soft colors, layout, and beautiful details of the 1st are breath-taking!!! The spotlight technique on the 2nd looks amazing, as does the twine and little tag! Fabulous job on both!! HUGS!! Two lovely cards, Lisa! The spotlighting technique on the second one is, as Angella said, amazing! Beautiful work, Lisa. Despite knowing the Spotlighting technique I never tryed it out. Maybe is time to start! Your work is inspiring. Love the soft colors, layers & designs on both your cards...they are beautiful!! Lisa...beautiful creations. I love the spotlighting technique and with the pearls behind the image makes it so elegant. beautiful designs and cards, Lis! love the spotlight one! These are both beautiful, soft and elegant. I have never tried the Spotlight technique but will be sure to try it now. I love how it enhances that beautiful die. Your colors are so pretty and those clouds, WOW! Two lovely creative ideas. I love the triple layer, and the spot light you did on both of them for a beautiful image.well done. Lovely cards, I especially like the spotlight one. Both cards are very pretty. thanks for the inspiration. These are so pretty, Lisa! Love the colors and matting on both. So lovely and springy! Beautiful! Love the soft colors. Using the coffee Archival ink combined with the light blue - very soothing/relaxing. Thanks for the sample cards. I'll be using my coffee ink more often having seen your cards. Two gorgeous cards! Love the the background on both cards! Have a Blessed day! Two beautiful samples Lis! Love the soft color combo of both and the little mini tags, and the spotlight technique was a great idea! Love the layers. The colors are soft and comforting. Thanks for inspiring me to use softer colors. Two amazing samples Lisa! I love the blues you've chosen - and your layers are so perfect on both. The second haw a nautical feel to me for some reason - definitely would be a perfect masculine sympathy card. Love all your details on both. Both of your creations are gorgeous, Lisa!! The first is so elegant with the soft blues, your layering and the beautiful coloration of the image. The second is so beautifully designed with the spotlighting technique and the addition of the twine and tag. beautiful cards - awesome job! Your cards are so lovely and I love the blues you used on them. 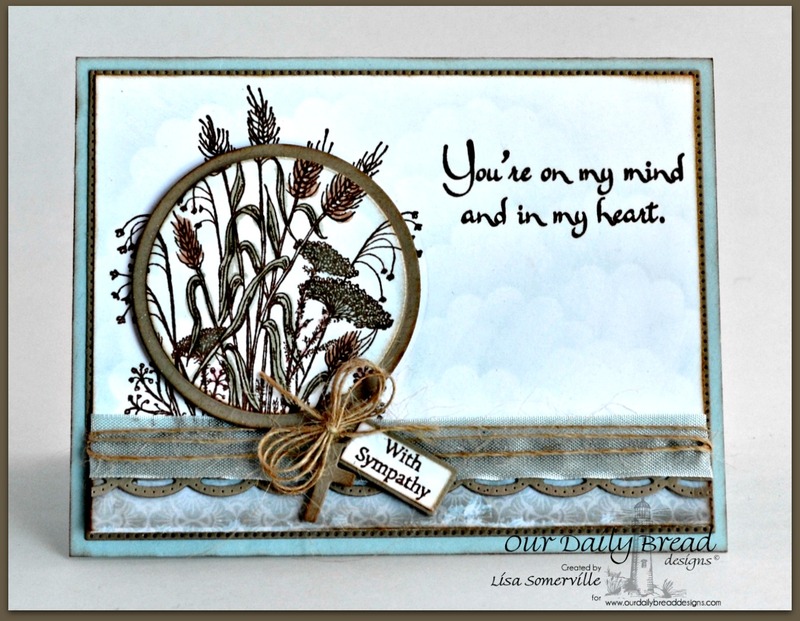 I really like your cards and how you highlighted just a section of your image using the wildflowers. Keep up the good work! The softness of both cards is excellent. They are both terrific. Beautiful!! I love the softness of the colors and how you added just a bit of color to the images. Really love your cards! I especially like your use of circles with the stamps. Your cards are going in my inspiration folder. I like the soft color palette of both cards. 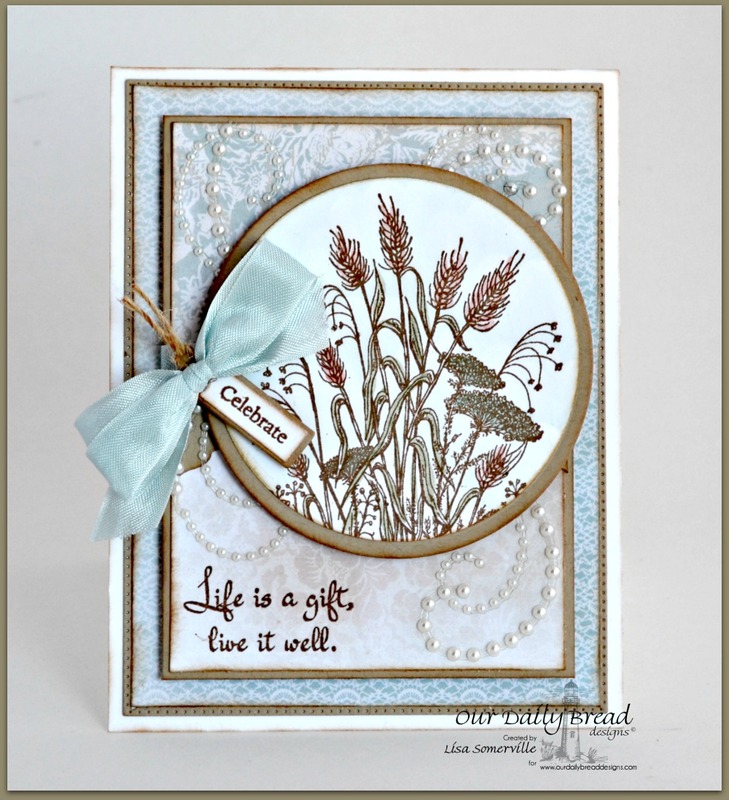 Such pretty cards, love how you die cut a focal point of the "Wildflower" stamps and showcased in on the card. Lovin' the new releases. Quite lovely Lisa! Love the soft elegance w/the soft coloring and beautiful pearls!! Oh, my goodness. I am almost speechless ... almost. Such beautiful cards. Wonderful coloring and color scheme. The matting circles are wonderful. I can't even describe how I feel about these cards. I am always inspired by your creations, Lisa! Love the soft blue colors with the kraft, the elegance of the layering and the pearls on the first, and the spotlighting on the second! Gorgeous, my friend! Hugs! What beautiful work. The spotlight technique jumps right out and is a favourite of mine. Hi Lisa! Both cards are gorgeous, but I like the second one especially. I've not heard of "Spotlighting." That is new for me and I must research that and try it. Your cards are beautiful! I especially love the unique design of the second one! Beautifully done cards. Love the little details you added. Both cards are beautiful and love the spotlighting you've done on them. Wow, all those comments! Beautiful cards, I guess I would say they are the same, but different. Lol. They are beautiful. Oh wow!!! Lisa these are both gorgeous! I especially love your color choices!